To many people, our garden at home in Wrenthorpe would appear to be an ideal candidate for a TV rescue programme. The lawn is full of ‘weeds’ and there is a lack showy non-native plants elsewhere in the garden. Indeed, at the moment the centre piece of the garden is a large clump of tansy and fleabane. To some it might not look pretty, but it is an awesome magnet for bees, hoverflies and butterflies. Indeed, on 28th July there were two holly blues and one comma butterflies feeding on the tansy, together with peacock, gatekeeper and green-veined white feeding on the fleabane. Other butterflies to visit the garden during July include ringlet, meadow brown, large white, small white, small tortoiseshell and small skipper, which was seen egg laying. 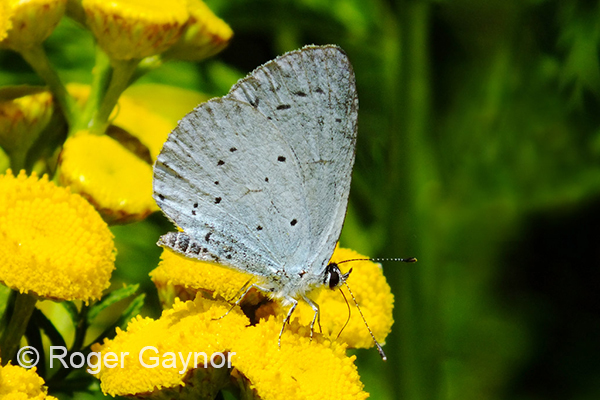 A photo of one of the holly blues is shown. Tuesday was a very hot morning for a walk around the balancing ponds in Wrenthorpe Park. Wildflowers sown in an empty flower bed gave us a fine display of poppies, cornflowers, bistort, yarrow and red leg. Purple loosestrife, goat’s rue, greater willowherb and meadowsweet grew prolifically in the damp ground around the pond. 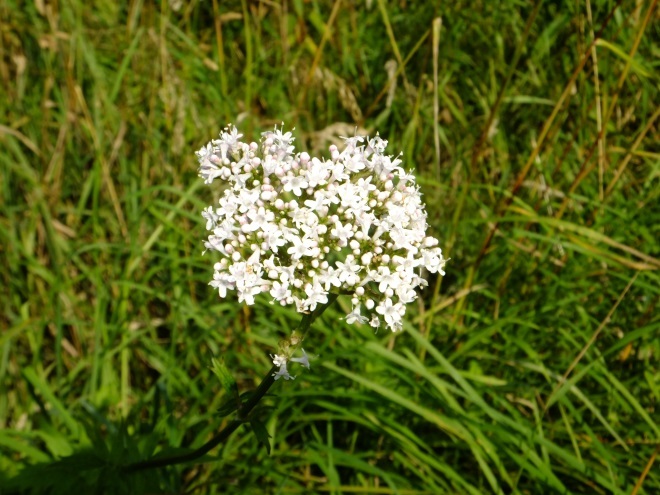 Water plantain grew delicately amongst the burr-reed and reed mace at the edge of the pond. Small skipper butterflies, small tortoiseshells and meadow browns were busy as we moved along the edge of the meadow and across the stream to see both hedge and marsh woundwort, common valerian, common hemp nettle and gelder rose. Workmen were cutting the grass in the meadow areas so we were fortunate to see what we did. 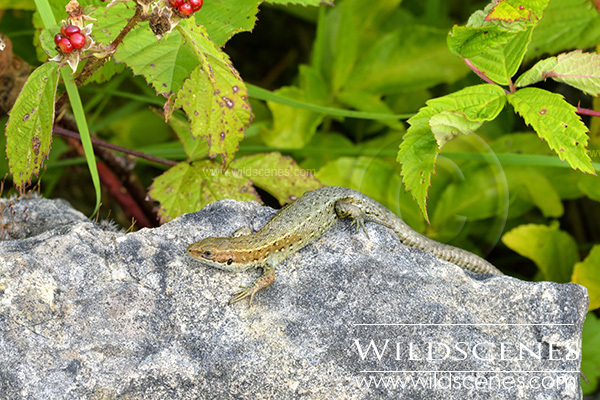 I was at Brockadale today and came across a colony of common lizard basking in the warm sunshine. There were three adults and around 6+ baby lizards. I hadn’t realised they occurred here and never expected to find common lizard in Wakefield. Here’s one of the images I managed to get. 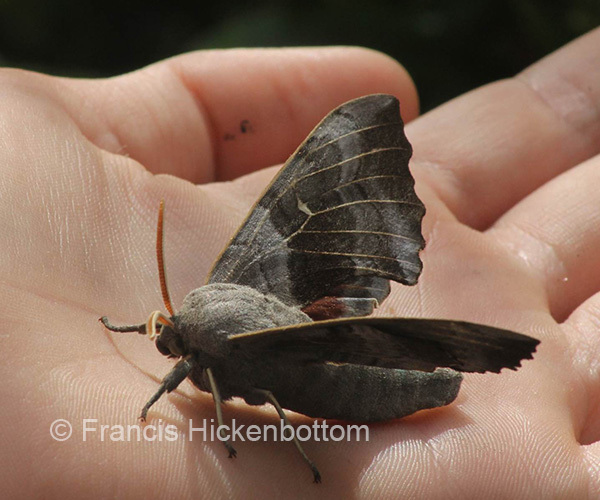 I did some moth-trapping in Pembrokeshire last week and a poplar hawk (Laothoe populi) moth turned up in the trap. When I returned to Hemsworth, I found that the same species is on the wing in my garden. 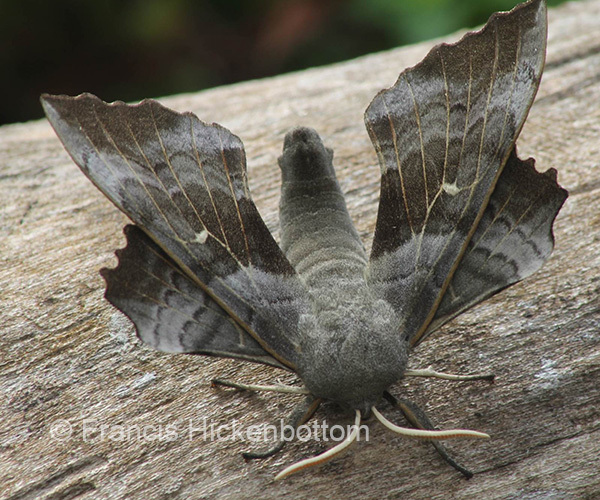 This is said to be our commonest hawk moth. 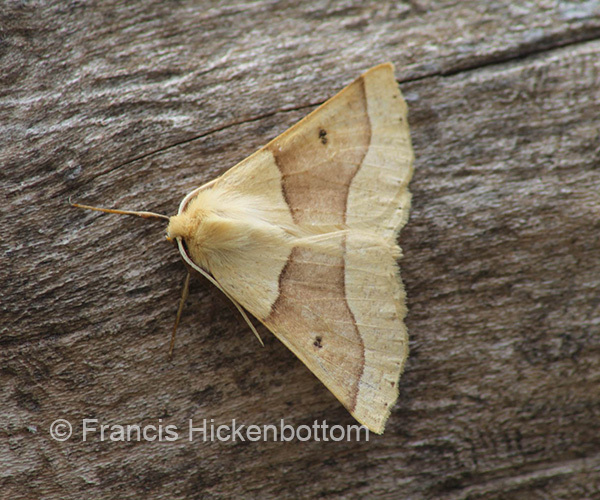 Last night, I also caught this scalloped oak (Crocallis elinguaria) – another common species – and it has been photographed on a piece of elm. Channels left by elm bark beetles are visible on the left of the picture. The car park area on Ley Lane was so full of beautiful meadow crane’s bill, small-flowered crane’s bill, white campion, dropwort and creeping cinquefoil that it took a while for the group to progress onto the track to the left of the car park leading to the woods. Rosebay willowherb, nipplewort, tufted vetch, meadow vetchling, black horehound, red campion, welted thistle, hedge bedstraw and field scabious were all in full flower along the track. As we stopped to look at soldier beetles covering a large hemlock an upright hedge parsley was identified amongst the cow parsley. Enchanter’s nightshade, wood avens and honeysuckle brightened the shade of the woodland and its very muddy track; our walk brought us into the meadow where the hogweed was attracting large numbers of marbled white, small skippers and dark green fritillaries. 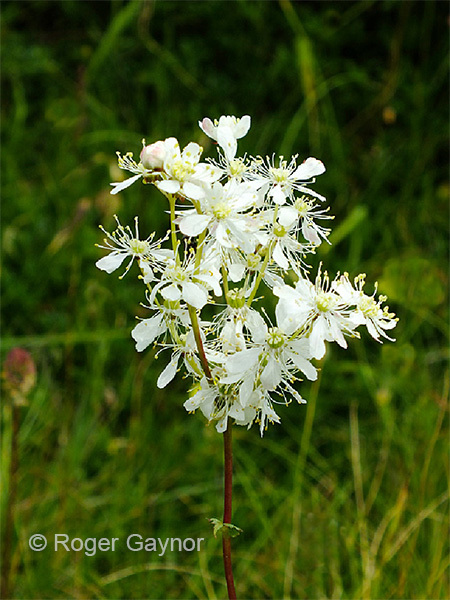 After resting on the bench we were able to enjoy other meadow flowers – common centaury, eye bright, fairy flax and clustered bellflower before returning along the track. The wall at the back of our dining room is a real sun trap and I often have a glance at it to see what insects are there basking on the hot bricks. Today I was rewarded with two or three ruby-tailed wasps (Chrysis ignita). These are beautiful, tiny solitary wasps with a turquoise body and ruby red tail but they are tiny and as yet have eluded my camera! I thought members might be interested to know that there is lots of viper’s bugloss growing and flowering at Fitzwilliam, where the City used to be, behind the remaining row of houses. Rubble from the demolished houses is now overgrown but it is still there and it must be quite alkaline because of the mortar. I saw musk thistle in flower there last year. These aren’t plants that I expect to see in Fitzwilliam. How do the seeds get there?